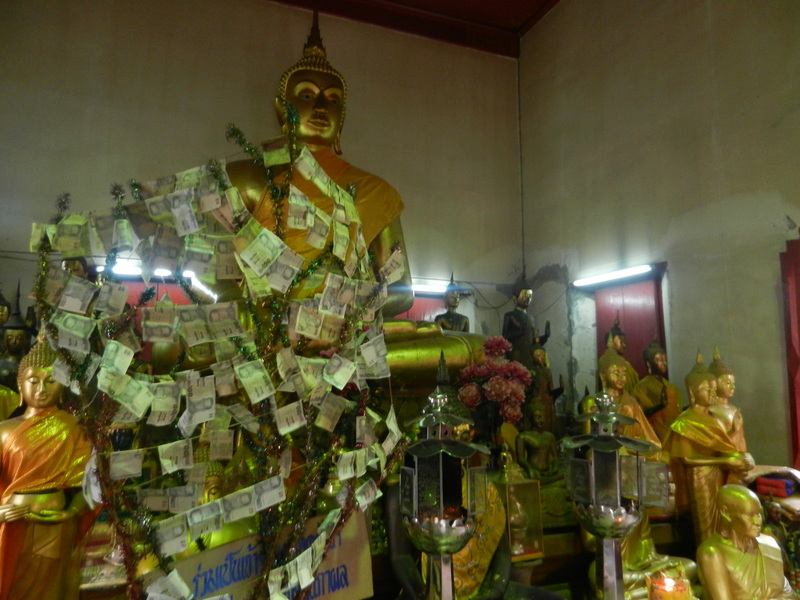 Grace becomes cash at Wat Khanika Phon in Bangkok. 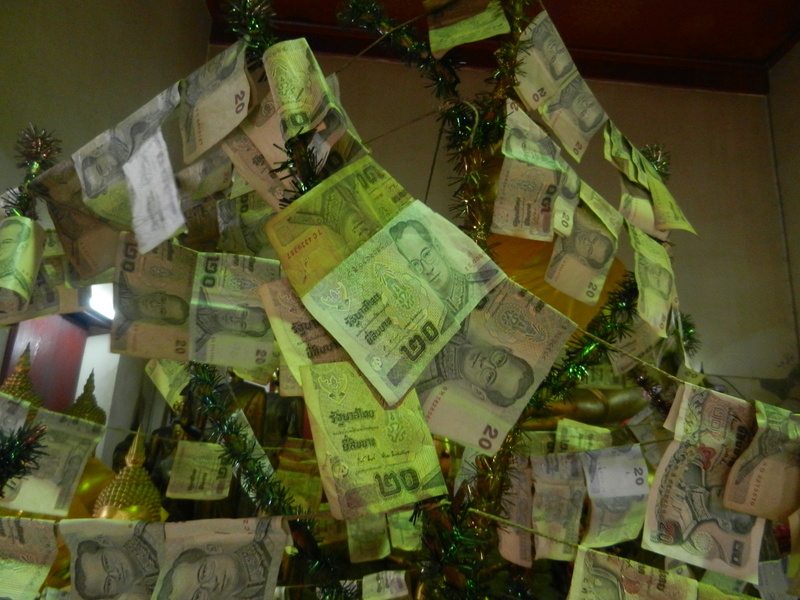 Many pretty forms and colors blend in Thai temples, so why not include some money? 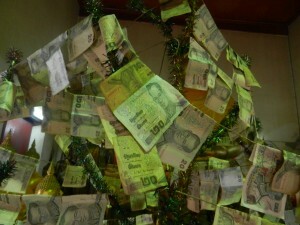 Come in and see more of the wealth in Thai perspectives. 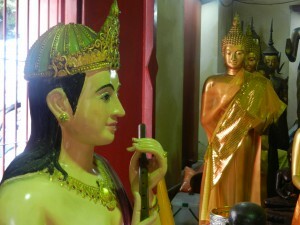 The last post explained that many statues blend their gentle forms and energies in Thai temples. This is true in Wat Khanika too. 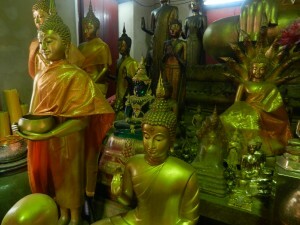 But though Buddha statues take center stage in Thai temples, many other pretty objects mix with them. This wat has a money tree whose crisp foliage shines with the statues. Is this a cheap use of spirituality for material ends? This is Thailand–harmony means more than contradictions. In the top photo, you can see King Bhumibol’s face gracing the notes. He’s on every denomination. Though he’s 85 years old and often living in a hospital, we see him as a dapper young man. Thais see him as a battery of grace. “King, Buddha and Thailand” was a slogan that King Vajiravudh spread about 100 years ago. So Bhumibol’s energy blends with the Buddha statues. Though Wat Khanika Phon is a Buddhist temple, Krishna joins the flow. But he’s not in the form of the charioteer in the Indian Bhagavad Gita, who drives the warrior Arjuna to battle. 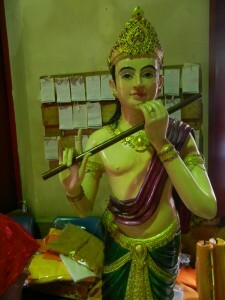 Instead, he follows Thai tastes and takes a peaceful form as the flute player. In Indian mythology he performs for beautiful teenage girls called gopis. But in Wat Khanika Phon, he adds his pretty notes to the Buddha statues’ grace. And he has a gentle Sukhothai smile at the same time. The most graceful images from both countries mesh. 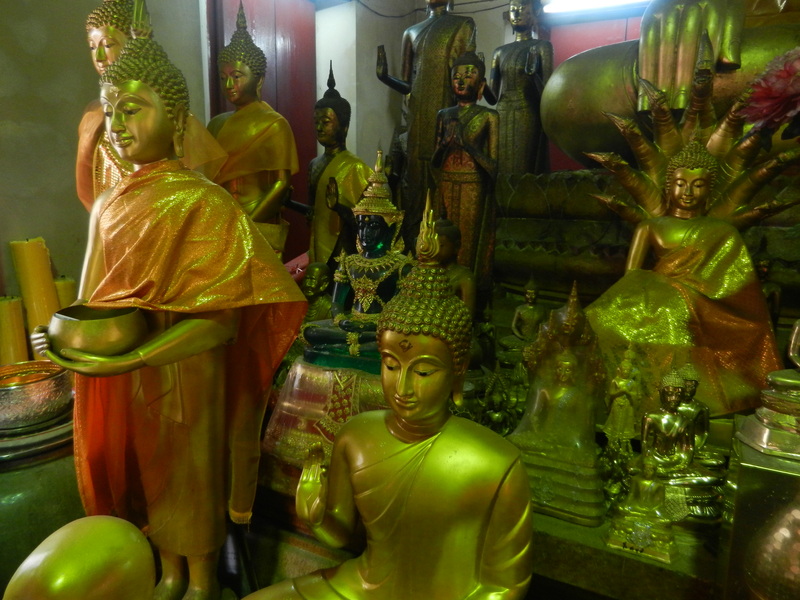 So the benevolent energy flows from Buddha statues can mix with other honored spirits and pretty objects. The blend was different in each of the hundreds of wats I explored in Thailand. They take on limitless varieties, so you can spend your whole life enjoying them. No wonder why many Westerners who go there don’t want to leave.